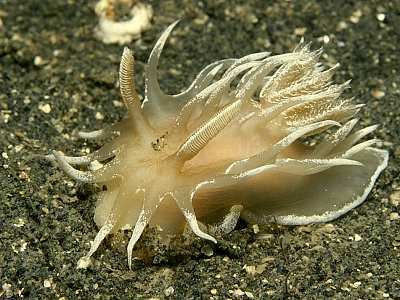 Description: Okenia leachii has a translucent body with a pinkish-brown hue and long dorsal processes streaked with white pigment. The processes arise from the mantle rim and in three rows down the back. The edge of the foot is also pigmented white, as are the rhinophore lamellae and the edges of the gills. Adults reach 40mm in length. 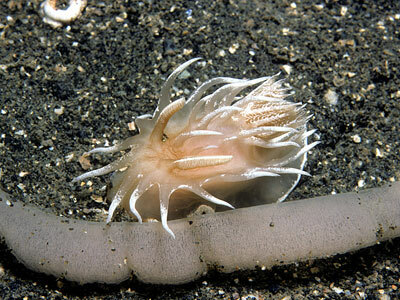 Habitat: A rare species found on muddy sand seabeds usually in deep water, below 25m. 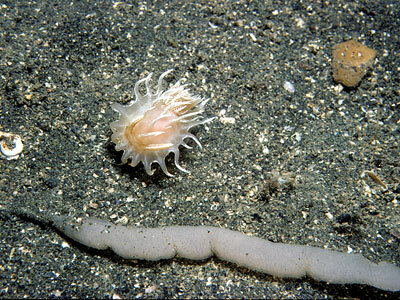 Probably feeds on burrowing seasquirts such as Molgula occulta. The spawn is a long sausage-shaped mass attached at one end by a filament. Distribution: Originally described from a single specimen from Shetland, there are recent records from the Celtic sea, and from the Shiant Isles and Skye on the west coast of Scotland. There are older records from Devon, Connemara and Norway. Long processes arising from the mantle edge and in three rows on the back. Pigmented with white on the gills, edge of foot, and all processes. Picton, B.E. & Morrow, C.C. (2016). Okenia leachii (Alder & Hancock, 1854). [In] Encyclopedia of Marine Life of Britain and Ireland.